For those single-lidders who find that constantly buying tape is a hassle or feel that the tape they buy doesn't fit their eyes well, this is an option for you. Cut your own! 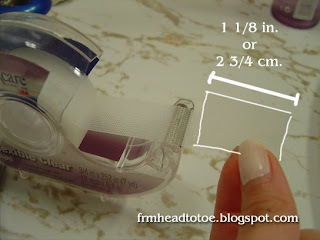 It is very inexpensive to buy a roll of 3M clear athletic tape in comparison to constantly buying pre-cut tapes. Also, you can find it at any Walmart or Target near the bandage section which is a nice alternative to going to an Asian beauty store if you don't have one nearby. Since one roll only costs around $3 USD, it is much more cost-effective to cut your own, plus you can adjust it to whatever shape you want. I found that a lot of pre-cut tapes aren't as wide or long as I want them to be, so it's nice to make it just right myself. 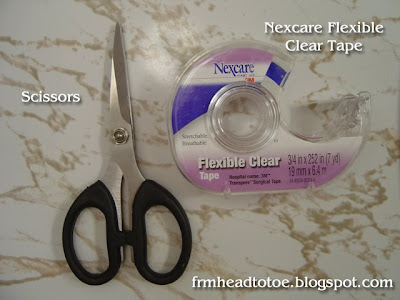 *Nexcare Flexible Clear Tape, 3/4"
First, cut the length that you would like your eyelid tape to be. I prefer mine to be a little longer (for when I am just at home or if I choose to wear it at night when I sleep) but it's up to your own preference. Next, cut the tape in half lengthwise. You should have two long rectangular strips. Carefully place one strip where it won't get stuck to anything. Take your scissors and round off the corners of the tape. You want to end up with a smooth, long oval. Do this for both tapes. Cut the oval in half again, lengthwise. Finally, round off the sharp corners once more. If you do this for all tapes (including the half you set aside in the beginning), you should end up with 4 eyelid tapes in the end. 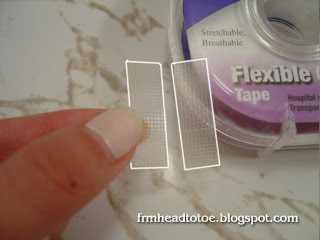 If the tape is too wide, you can always make it skinnier or shorter on the sides. Practice makes perfect, so I would suggest making a few in different shapes and sizes to see what looks best on you. Just remember that you can always make it smaller but you can't make a cut tape bigger, so start out wider and longer in case you want to cut it down. Another thing that helps is to study the shape of pre-cut tapes and try to mimic it. After a few tries, it'll get much easier to cut it just the way you need. Hopefully this will save you in emergencies when you run out of tape and can't make it to the beauty store, or if you get frustrated with what's available. Good luck! beautiful! could you post the pic of the eyelid tape on your lid outlined in white so we can see the placement of the tape on the lid clearly? (a pic was in one of your previous posts)thanks! Hi.. I was wondering how safe is it to use tape on your eyelids. What are the long term effects? I've been told not to use the tape or glue because it makes your eyelids droopy in the long run and also makes the creases become uneven over time. Not to mention, if you decide to have eyelid surgery, I hear it's difficult for the doctor to perform surgery on it because our eyelids become damaged internally. Also, isn't the skin around our eyes very delicate? Wouldn't repeated use of tape cause wrinkling of our skin? I noticed you were using the first-aid tape.. do you know what chemicals make up the sticky part of the tape? because using the tape constantly may cause harmful chemicals to diffuse through our skin which is porous. I'm really hesitant about using the tape because I don't want to have smaller eyes in the long run without the guarantee of permanent double eyelids from tape (or glue). anonymous 3: Tape and glue will only make your eyelids droopy if you aren't properly removing it. 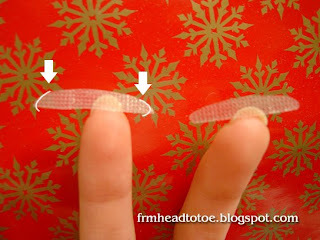 If you just rip off the tape, it will stretch the skin and cause droopiness over a long period of time (years). I promise you, doctors who do double lid surgery probably have a majority of patients that wore tape or glue. It's nothing they couldn't fix. It's silly to think that you can get "damaged internally" when the tape and glue only affects the outside part of your skin. The first aid tape was made to be put on your skin. People usually use it to dress wounds. Of course there aren't harsh chemicals in it! I don't think there's any health issue whatsoever that you need to worry about. I'm sorry nobody can guarantee you your lids will be permanent. It all depends on the thickness of your natural eyelid. Some do wear it for years and it never turns permanent, but for my mom, aunts, and cousins, they all turned to double lids after about a year of use. I've only used it on a regular basis since January, but I've had no problems with droopiness or any health problems with my eyes since then. As for wrinkling, creating a double lid is pretty much forcing a wrinkle to form where you want it to. You always try to put the glue or tape so that it makes the exact same crease every time for it to work. If done correctly, it shouldn't cause any other random wrinkles to form. I can't give you any statistics about double eyelid tape, but I will say that based on the hundreds of thousands of women who have used it before, you don't have anything to worry about. omg you are so creative! you're quite the guru! i love this idea, i'm totally gonna do it! I found this blog via Soompi(? )via googling Solotica lenses. Bravo. I love your photo tutorials. I have a question about the tape? Do you wear it all day under makeup or do you wear it and take it off prior to makeup application? I'm korean too and have one creased eye and one uncreased so I'd love to balance out my eyes, but know nothing of how to tape or glue eyelids. interesting. i've never tried eyelid tape or glue, but i'm curious to see what i'd look like with it. Your eyelid problem is probably because the amount of fat in your eyelid changed as you grew through puberty. Sometimes we can gain and lose weight quickly in different parts of our bodies during times of rapid growth, so I'd bet that once you hit your more "mature" stage, your eyelids naturally thinned out giving you back your original double eyelids again. Even I developed doubles naturally once in a while before I used tape and glue if I was very tired. That kind is usually temporary though. Hope that answered your question! It's really quite good and looks really natural and you can't see the tape when worn maybe you can try it too! Thanks for this tutorial! I've been using pre-cut tapes but they do get expensive to buy after a while. I did not know that hospital tapes like these exist, and they are indeed a much cheaper alternative! your tutorial was really awesome. i bought the roll of tape and made some double eyelid tape and it worked well! i have a few questions though. i heard that some people use eyelash glue on their eyelids as double eyelid glue. have you heard of this? do you know whether it's safe or not? also, if you use eyelid glue, will it stretch your eyelids even more than tape because it glues your eyelid together and when you blink, your eyelids will be pulled? Is this tape double sided?? (sticky on both sides?) Or is it just sticky on one side? And if so, how does it get applied?? has anyone used this tape for myasthenia gravis . and how long does the tape stay on once applied? i did wear it to school and half of the day, it's harding my eyelid bcz of the edge of the tape!. i have slightly creased eyelids therefore whenever i apply the tape i end up with 2 creases and it looks really wierd..
the only way to get rid of it is if i squint or smile really hard so that the top crease goes away..
does that happen to you sometimes? and how do you remove the tape? i've tried removing it with warm water but the tape just won't budge !!! Anonymous: The tape is only single-sided. 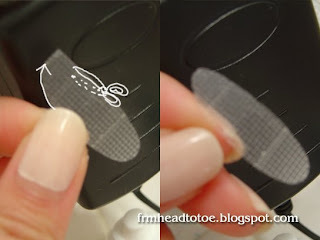 If you have a double wrinkle forming, try placing the top of the tape right at your natural wrinkle/crease. 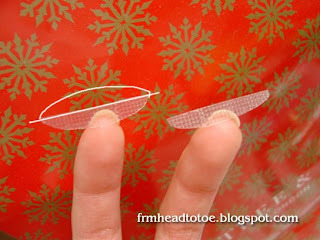 Or, you could try placing the bottom of the tape right at your lash line. It pretty much works the same way as the glue but is way less messy. I'm going to continue experimenting but this seems to work wonderfully so far. wowww ! seems cool but does it really work D: ? can u post a clip up showing us how to do it D: ? :D ty very much !! Omg, thank you so so so much for this blog post! I've searched EVERYWHERE but I never got satisfying results. Most people prefer using eye glue, but from my experience, you can't apply heavy makeup afterwards because it dries the glue. Once again. Thank you so much! I'm going to try these tricks right away! Hope to see even more beauty tips here!! hi.... how to remove the tape properly? i'm scared too hell if one of my eyes get droopy, bcause i just wear it on one eye, thanks. Are you trying to imply to other Asian girls who are born with "mono-lids" to be ashamed of themselves because, from what I'm getting from this video of yours, by putting on "eye lid tape" makes you look more attractive? This question may seem a bit harsh but it just seems to me that tutorials like this are trying to mold the traditional Asian girl into what society thinks is beautiful while putting aside the true beauty of being a "mono-lid". I think I'll try this. Thanks for the tutorial! I am Asian/White, & while I have a crease on both eyes, it is very close to my lash line, & my eyes are mostly flat-set, tucking under the droopy lid. I have a similar issue to one I read here, where my eye liner doesn't show unless it is put on very, very thick, & then it gets oily from being tucked under the lid & runs. I recently got permanent eye liner, but I still hate looking tired from the droopy eyelids. To Jing, I understand your question, & I don't think she's implying that anyone should be ashamed of themselves. I think she's trying to help people who like her, didn't like the way their eyelids were shaped - for various reasons. Mine is because my makeup doesn't stay on & I look tired. I've seen that a lot of Asian women are interested in changing the shape or appearance of their eyelids, but I think there are various reasons - each personal to the individual. I think tutorials like this are really helpful, as I've struggled with an "issue" with my eyelids ever since I started learning to put on makeup. If women are secure with who they are, I think it's great for them to find a tool that will help them be happier with their appearance. Their reasons for wanting to look different - well, that is their own business. Super cool! Thanks so much! I ordered some Koji TUCK IN tape to try out, then I am going to use your method for creating my own! So kind of you to share this with us! LOVE BEAUTY AND HAIR tips! You Rock! What happens if you happen to have such, well how do I put this, 'deep' double eyelids that the top fold goes over the bottom and looks like a monolid? Will this still work? Thanks i like your blog very much , i come back most days to find new posts like this!Good effort.I learnt it. What way does the sticky side go? Does it face up or does it stick onto your eylid? What side does the sticky side go? Does it face down or up? Hi, love your blog since I found it. Been following it avidly since then. I want to know do you apply it the same way before you go to sleep and how does it work? Thanks. this is so awesome, just tried it and it worked better than the premade tape, now if it says on the same as the premade, I am sold! thank you for sharing, it's awesome! thank you for sharing, it is awesome ! !